If dtc p0011 or p0012 is displayed, check the vvt system circuit. Read freeze frame data using the hand–held tester or the obd ii scan tool. Freeze frame data records the engine conditions when a malfunction is detected. When troubleshooting, it is useful for determining whether the vehicle was running or stopped, the engine was warmed up or not, the air–fuel ratio was lean or rich, etc. At the time of the malfunction. Connect the hand–held tester to the dlc3. turn the ignition switch on and push the hand–held tester main switch on. select the item ”diagnosis / enhanced obd ii / active test / vvt ctrl b1”. check the engine speed when operating the ocv by the hand–held tester. Operate the hand–held tester to erase the codes, or disconnect the battery terminal or remove the efi fuse for more than 60 seconds. drive the vehicle around for 10 minutes or more. 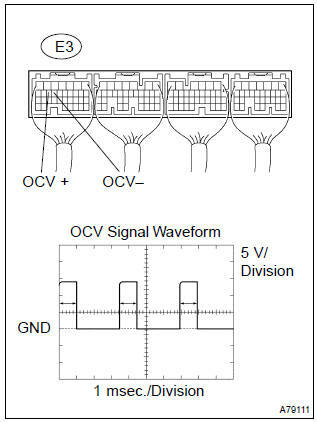 read output dtcs using the hand–held tester. : *: dtc p0011 or p0012 is output when a foreign object in engine oil is caught in some part of the system. These codes will stay registered even if the system returns to normal after a short time. These foreign objects are then captured by the oil filter, thus eliminating the source of the problem. reconnect the battery terminal or install the efi fuse. during idling, check the waveform between the terminals of the e3 ecm connector. 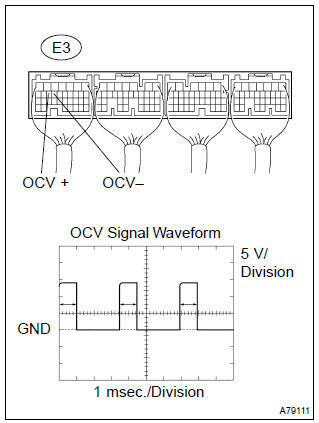 read output dtc using the hand–held tester. check the engine speed at (1) and (2). Disconnect the c2 camshaft timing oil control valve connector. 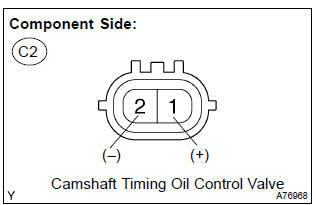 Apply battery positive voltage between the terminals of the camshaft timing oil control valve. Reconnect the camshaft timing oil control valve connector. Operating the obd ii scan tool to erase the codes, or disconnect the battery terminal or remove the efi fuse for more than 60 seconds. read output dtcs using the obd ii scan tool. Operate the obd ii scan tool to erase the codes, or disconnect the battery terminal or remove the efi fuse for more than 60 seconds.